The holidays may be over, but we’re still in the thick of winter…and flu season. If you’re a parent, you’ve probably noticed viruses like the flu can spread around schools and daycares like wildfire. With that in mind, we’ve assembled some tips on how to keep your family healthy during this germ-filled time of year. One of the easiest ways to keep the germs at bay is regular hand washing. Kids are notorious when it comes to sudsing up—there’s just too much excitement in their little worlds to stop and get clean! But this is such an important habit to instill. Be sure to teach your kids the proper technique, and maybe have them a song to help make this chore a bit more fun. “Twinkle Twinkle Little Star” or the “ABCs” are just about the right length. Kids need way more sleep than adults. While we may be able to run on 6 hours, a child typically needs around to 10-11 hours a night. If they aren’t already, get your kids into a regular bedtime routine, so they get as much sleep as possible and keep their immune systems in tip top shape. Make it a habit to turn off the TV and any other screens an hour before they’re supposed to go to sleep, so they don’t get distracted and caught up in a show that might take them past the agreed upon bedtime. This will help their little brains unwind a bit, too, causing them to feel sleepy at the appropriate time. For parents who work full-time and kids with after school activities, cooking healthy meals on a regular basis isn’t always easy…but a well-balanced diet really is the key to a healthy family. Besides building their immune system, eating healthy with your kids now creates healthy habits they’ll have for a lifetime. For recipe ideas click here and here. Keeping your kids hydrated is always important, but especially during this season. The low humidity during winter tends to dry out our nasal passages, making it easier for cold and flu viruses to get in our bodies (all that mucus is actually a really good defence system). Staying hydrated boosts the immune system and will help keep your kids healthy and feeling great all winter long. Most kids tend to sneeze all over EVERYTHING…which is why teaching them the proper sneezing technique is so important, especially when the flu is running rampant. 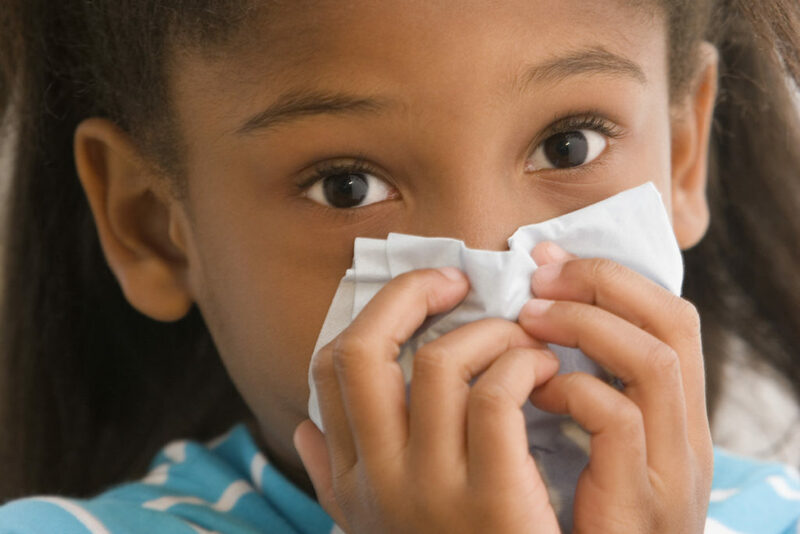 Rather than having them sneeze into their hands or elbows—which still leaves others at risk for catching their germs—stuff their pockets with tissues or handkerchiefs, and teach them to always sneeze and cough into those. Your kids’ teachers and the other parents will thank you! While there’s no 100% foolproof way to keep your kids completely healthy and germ free all the time, keeping these easy tips in mind will go a long way toward ensuring your family stays as healthy as possible, all winter long.